There’s a maxim fiction authors hear all the time: Write what you know. That’s fine, as far as it goes. But does it go far enough? Not for me. But sometimes I need help. If authors stick only to what they’re personally familiar with, they will be severely limited in what stories they can tell. But when we want to branch out into less familiar territory, how can we be sure we don't misrepresent events, facts, or—worst of all—the genuine experience of people in a life situation that should be treated sensitively and represented accurately? My resource is the SME. The subject matter expert. 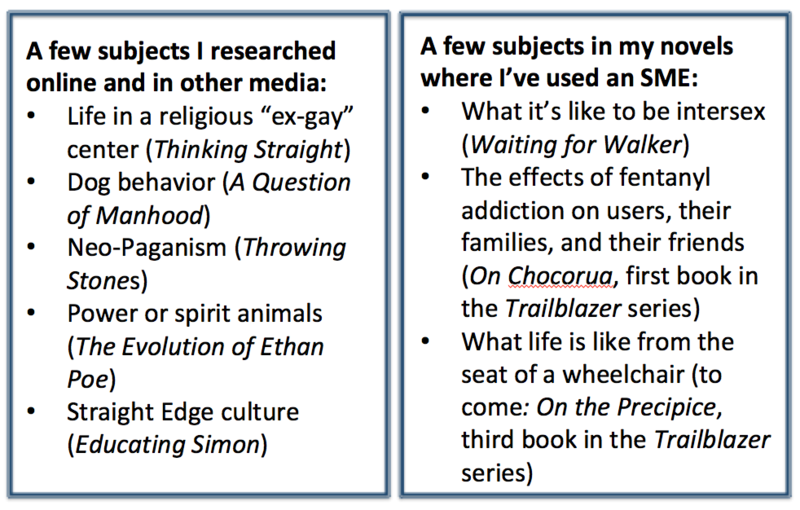 Sometimes that's a one-way resource, in which I research online or in other media (books, documentaries, etc.) for information. Other times, I need to be able to interact with someone who has direct experience or acknowledged authority on a subject. My February 22, 2019 blog post on Hidden Gems describes where I find both types of resources. Take a look; authors might find some useful pointers, and readers will get a window on the work that goes into the stories they love.